Before I get into this review I should probably start off by saying I’m heavily biased towards anything Superman. I’m not a fanatic, and I really don’t collect anything Superman, but I am a really big fan, so much in fact that I’ve got the Superman seal tattooed on my right arm. I absolutely love that DC has been coming out with a lot of great cartoon movies based on DC superheroes, and that they aren’t aimed at children. The movies they’ve been making are well written, animated, and do justice to their heroes. At first I was not aware that this particular film was based on a comic series as I’ve not been an avid reader of comics for some years now. 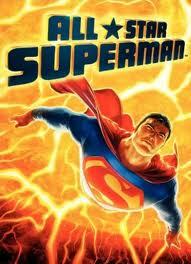 If you are a classic Superman fan, then I think you will love this film. The basic plot from the beginning is that Lex Luthor arranged for an accident to cause Superman to be over exposed to the sun’s radiation. This causes his cells to be super charged, he is more powerful than ever but as a result the stress of the increased power is breaking down his body into pure energy. Superman discovering that he will soon die, decides to do a number of things he’s always wanted to, Superman’s Bucket List if you will. In this film we get to see a number of things such as, Super Lois, Superman’s star-eating pet, Kryptonian Astronauts, a glimpse into Superman’s future, and also cameos by super villains, Parasite and Metallo. The voice acting in this film is great and is very similar to past Superman movies/cartoons. There are a few unusual characters in this film that I am sure are from the comic series that took place over a few years. You also get a look into the Fortress of Solitude, which is more like how the comic books portray it, with robots, rare weapons and animals, and more. Ultimately in the end it is a battle between Superman and Luthor. With Superman feeling much weaker than he ever has, he still must put a stop to Luthor’s plans. The end of this film really took me by surprise and I don’t want to ruin it but it really is great, and a wonderful ending for Superman. I think one thing above all else in this film is the animation. Past cartoon movies about Superman have either been too simple or too complex for my taste. The style they chose to go with is realistic enough to not feel like a kid’s cartoon, I really enjoyed it. They have pulled this off with other cartoon movies such as Batman : Red Hood, and the recent Green Lantern cartoon film. If you aren’t aware of these DC films, you should keep your eyes open for them. You can find most of these including this one, on Netflix and sometimes at a Redbox machine. This entry was posted on 06/07/2011 by Charles. It was filed under Movie Review, Superman .